Welcome to the Crazy Crafter's / Pootlers blog hop for December. This month we're excited to share with you the "Spring/Summer 2016 and Sale-a-Bration" sneak peeks, which we hope will inspire you to get creative too! You may just be starting the blog hop here at my blog - Camille Moriarty - or may have come from the person previous to me - Jessie Holton. Be sure to click on the "next" button further down to continue your journey on this blog hop. This month, we (the Pootlers, in the UK) are joining forces with the Crazy Crafter's (Australia) fit the blog hop. Thanks to the Crazy Crafter's for inviting us Pootlers to join in! The brief given was to create something using just one punch or die, one stamp set, one designer series paper, and one ink, from the upcoming Spring/Summer / Sale-a-Bration catalogue. 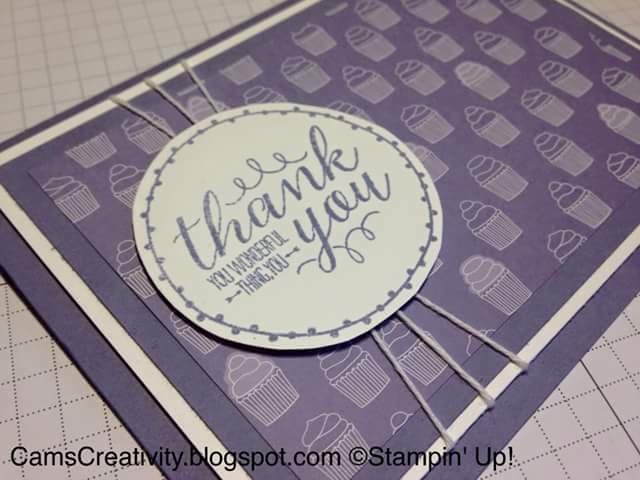 Choosing just one design was so difficult, as I fell in love with almost everything, but I eventually settled on the "You're So Lovely" stamp set, teamed up with the "Have A Cuppa" designer series paper stack, "Have A Cuppa" cardstock pack, and "Wisteria Wonder" Stampin' pad. I can't wait to share with you some of my other creations from the Spring/Summer and Sale-a-Bration catalogues, so please do hop back again some time soon! Why not take a peek at what other Crazy Crafters and Pootlers have created by clicking "Next/Previous" below. Here is the list of everyone taking part in today's blog hop, and as usual, you can find a list of the Stampin' Up! products I used in my project below. Camille Moriarty <=== you are here! Remember, for every £45 you spend on Stampin' Up! products during Sale-a-Bration (5th January - 31st March '16), you get to chose a FREE product from the Sale-a-Bration catalogue! Look out for more details nearer the time. Love the colours. I hadn't even noticed this DSP in the catty, now I will have to go back and take another look. 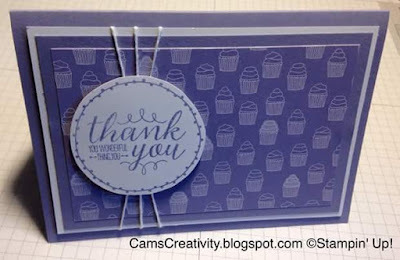 Beautiful Wisteria card Camille - lovely layers, I love this suite! I love that suite too! I can't wait to play with mine! Thanks for your inspiration! Beautiful card - thank you for sharing with us. Great card Cam! That sentiment is fantastic. I love this in Wisteria Wonder. Lovely card. Beautiful card Camille! Love the layering. Ok, I have to say I LOVE THIS CARD!! !